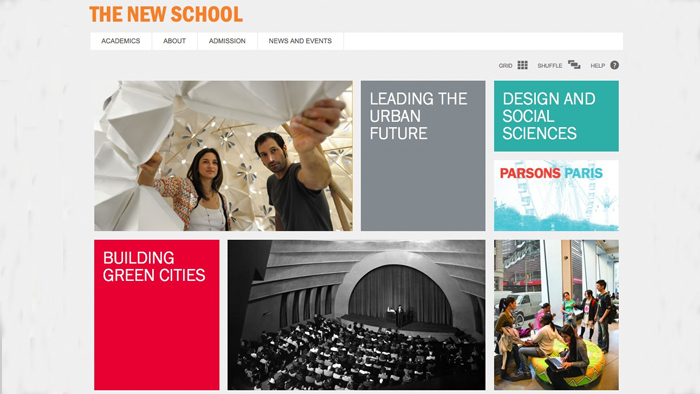 On December 6, The New School unveils an exciting project months in the making: a refreshed, refurbished, and redesigned website. The new look includes substantial feedback from students, faculty, and staff—all culminating in a unique, eye-catching and easy-to-use design. The new site is dynamic, colorful, and most importantly, self directed. You can move, expand and shrink the homepage’s 14 gridded boxes highlighting news, photos, and facts. Interested in design? There’s a box for that. What’s the latest news on courses? There’s one for that, as well. Another new feature of the website is dedicated information areas. On the upper-right-hand side of the page, the “Information For” dropdown menu directs viewers to areas specially curated for different users. Students, faculty, employees, parents, and alumni can now bookmark their individualized areas for up-to-date links, news, and resources. This sleek and eye catching redesign for the homepage and information areas, as well as mobile optimization and an impressive New School timeline, are just the beginnings of a larger project aimed at transitioning every page of the university website into a similar look and feel. Be sure to share your impressions and suggestions with the website team by using the link to the feedback form on the home page—and stay tuned for more updates!